Saanen Reference Does - spinningspidercreamery's JimdoPage! 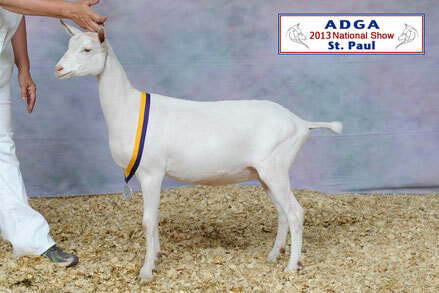 Click on any animal's name for a link to their ADGA genetics page, including LA scores and DHI records. 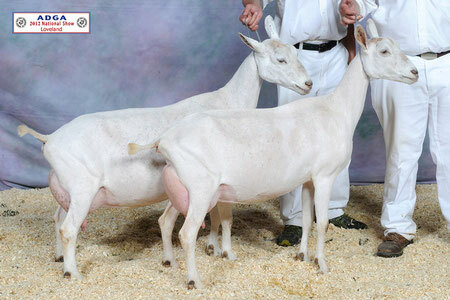 SGCH Spinning Spider AV Changes (2yr), SGCH Spinning Spider DM Bubbles (3yr), SGCH Jug-Tavern's D. Edelweiss (4yr), SGCH Spinning Spider ABDM Halelujah (7 yr). Third place dairy herd, 2013 ADGA National Show. Halelujah was one of Cullen's favorites. We loved her general appearance. While not an extremely tall doe, her smoothness of blending particularly in the front end assembly was exceptional. She also had a lovely udder, especially well attached and high in the rear. This is a trait she consistently passes onto her daughters. 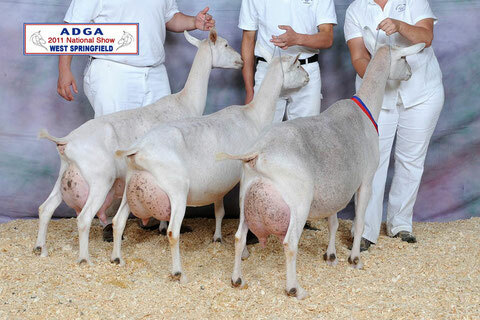 2013 ADGA National show, second place with second udder in the aged doe class. Praise was our first Halelujah daughter and was very similar to her dam. Her udder had the same height and strength of overall attachment and she carried the same lovely general appearance of Halelujah. If there's one area of the scorecard in which she excelled her mother it was in body capacity, particularly in her depth of rear barrel. 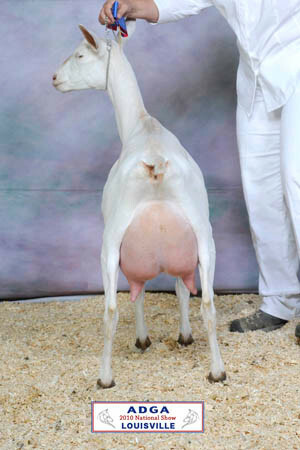 She produced lovely sons and daughters, including the 2013 Jr National Champion Saanen, Spinning Spider Hawk's Hotlips. Providence is a Halelujah daughter by Noble-Springs Zeppelin. 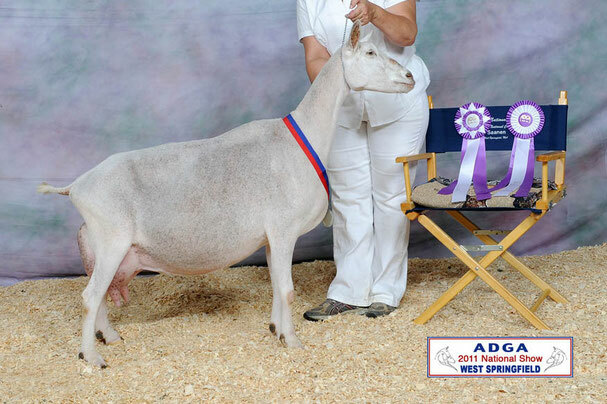 2014 was her year to rise in the show ring, easily finishing her permanent champion status and her superior genetics. 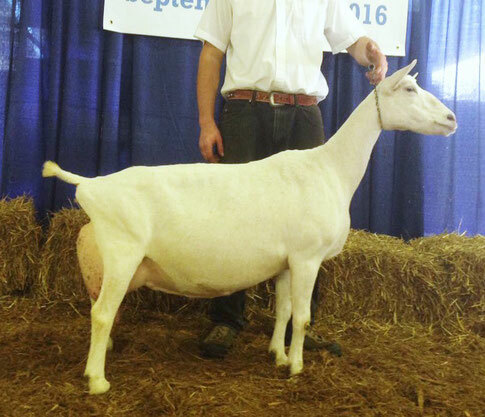 She beat her half sister, Gratitude, in the ring at the 2014 ADGA Nationals and has matched her production step for step. In 2016 she was second place with second udder 5-6 year old milker at nationals. Her son Spinning Spider AP Babylon has been retained for use in our herd. 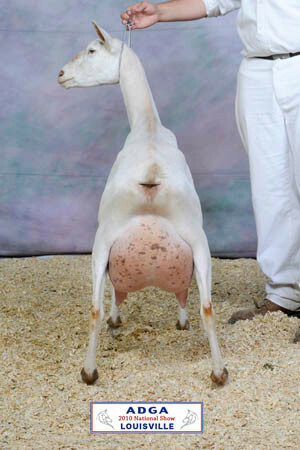 Edelweiss was purchased as a kid from Will Pearson's fine Saanen herd. 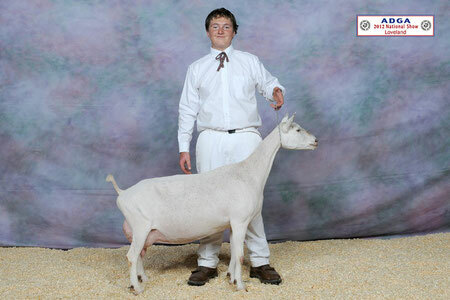 As a yearling she stood second in her milking class with first place udder at the 2010 ADGA national show. 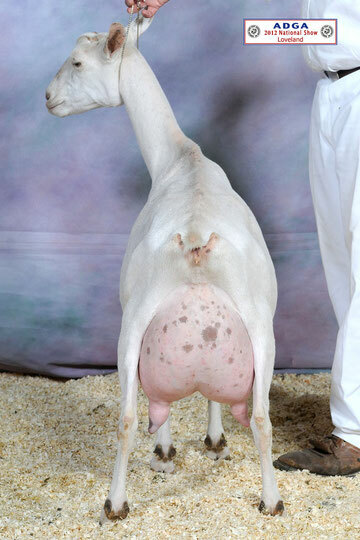 Her udder has continued to improve as she's aged into a beautiful doe. She's a long and powerful with depth of body. 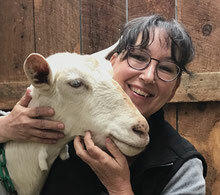 Along with her many BIS show wins, she's been a foundation doe for the herd and consistently one of our best producers with high protein and butterfat. She stood 6th place in the 4 year old Saanen class at the 2013 ADGA National show and 9th in the 5-6 year old class at the 2014 Nationals and has been anchor to most of our dairy herd wins. Added to that, she won the high 305 butterfat award at the 2014 Nationals. What we love most about Edelweiss is that her daughters follow in her footsteps, both in production and type. 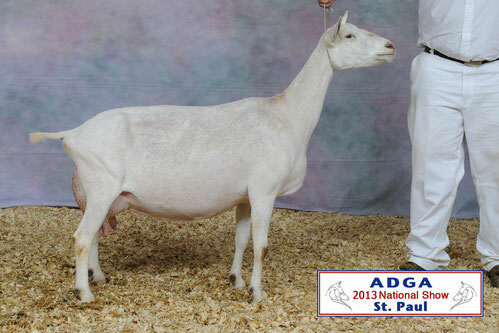 Bubbles is a half sister to Halelujah, sharing the sire, SG Rock-Point Demi's Demand. The stamp he put on his daughters was a tremendous high, wide rear udder. However, Bubbles was pretty much a sleeper in the herd. A not so impressive, smallish dry yearling, she freshened as a two year old with a large body and a lovely, but tiny udder. She was off and on our sales list all summer and we had many arguments over whether she stayed. We gave her one more year and we are so glad we did! 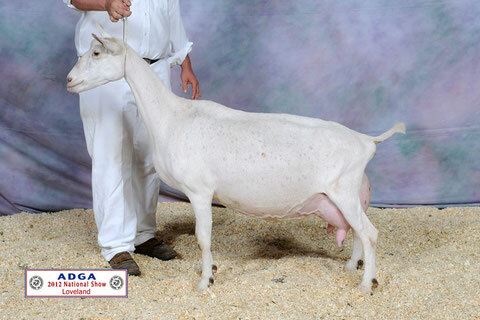 Her second freshening as a three year old saw her winning 3rd place with 3rd udder at the 2013 ADGA National show. Her production went from meager to tremendous, and she hasn't looked back. 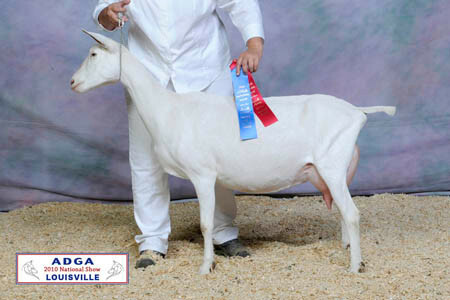 Her local show career found her taking back to back BIS awards over two days in both the youth show and the open show at the NC Mountain State Fair after a long show season, because once she matured, production was no longer an issue for this doe. 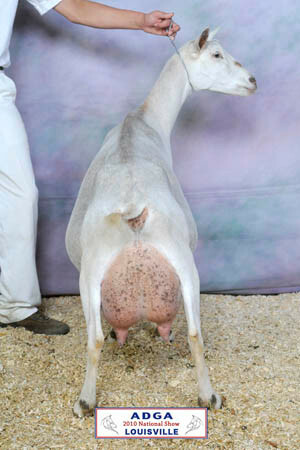 Cassandra exemplifies the type of Saanen doe we breed for. She was sharp, angular and naturally uphill with smooth shoulders and a deep brisket. She was also deep bodied and beautifully proportioned. Over 7 lactations her udder remained high, wide and well attached. Unfortunately, kidding season 2012 proved too much for her. We miss her but know that through her progeny she has contributed to that "Spinning Spider" look so many of our Saanen does now carry. Chantal was the total package of our breeding program. Appraising 92EEEE in 2011 as a three year old second freshener and 91EEEE after a long trip to the 2012 Nationals in Colorado, we felt she had the potential to surpass Cassandra. This was no surprise as her dam, Chloe, is a paternal half sister to Cassandra with similar dam lines. 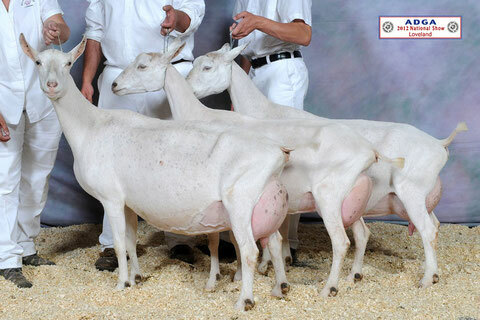 Along with her lovely style and conformation was a tremendous will to milk even with a challenging show schedule. We lost Chantal on Christmas day 2013. It was a tremendous blow to our family as she was truly cherished. On a bright note, in 2013 she kidded with triplet daughters who are proving themselves every day. 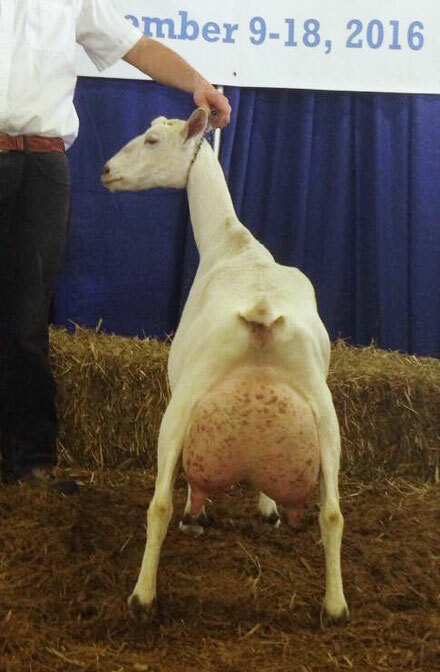 Her 2012 buck kid, Spinning Spider Fortunate Son now has milking daughters in the herd that also reflect Chantal's conformation and production.